This post is a continuation of Creating HTTPS SSL Self Signed certificate. SSL Certificates are created for one particular ‘cn’. This can be your domain name (www.example.com). Certificate Validation Exception may occur when you try to access your host another way (for example using IP address instead of domain name or accessing it from localhost). If your Spring Boot app is running on embedded Tomcat, you need to use the TomcatConnectionCustomizer class to set up the HTTPS in Tomcat. This path I will use in my app configuration. Create class implementing the TomcatConnectorCustomizer, and override its customize(Connection) method. As you can see, in customize() I set exactly the same properties as in stantalone Tomcat xml configuration (see this post). Note that in class constructor I convert the alias string to lowercase – in keystore only these are allowed. In most cases when you create a web application you need to restrict it to certain groups of users with login and password, manage their roles and sessions. Spring Security helps to develop secured apps supporting all of the AAA aspects: authentication, authorization and accounting. This post will teach you basics about the login & password authentication along with roles and permissions. The code is based on the Spring boot MVC tutorial with Java Configuration (Annotation driven). Firstly, follow the Spring boot MVC tutorial or download its final source code. Rest of this article is based on it. This Java configuration will create a Servlet Filter for all of your Security. It will protect the application URLs, validate username and password, handle redirects to login form etc. The most basic configuration is to use the hardcoded login, password and role. This way all of your resources will be protected with these credentials. To do it you need to create a Security Configuration class, extending the WebSecurityConfigurerAdapter, and annotated with @Configuration and @EnableWebMvcSecurity (or any other security scoped annotation: @EnableWebSecurity, @EnableGlobalMethodSecurity or @EnableGlobalAuthentication). You can use them to logout user, check his role when requesting the particular page and check the logged in username. 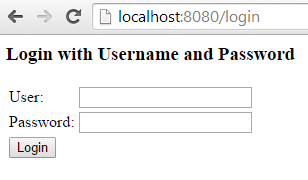 This is a html form that on submit will post under the /login url with username and password params in http header. This way you can read the url param and show message to the user about incorrect login or password and the logout message.